For years, I wasn’t summoned. Then, fifteen years ago, I started being called every two years like clockwork. Pain though it is, it’s the one civic duty required of every U.S. citizen. My worst experience as a juror was about nine years ago. The case involved a drug bust and the DA was a disaster. There was confusion as to whether the defendant had had his jacket switched with another guy while both were in a holding pen and the DA phrased each question so poorly, he implicated his own client. Finally, the jury got the case and things got worse. After a long day’s deliberations, we were sequestered in a sleazy motel near LaGuardia airport. And, we each had a roommate! Husband in my bedroom, great; total stranger, not so good. I think we’d still be in that jury room if a juror’s wife hadn’t gone into labor and the judge, in excusing the husband, dismissed us and the case. A year later, I ran into a woman who had been on that jury who told me the case had been retried and the perp convicted. How much money did it cost New York City to go through the whole performance? 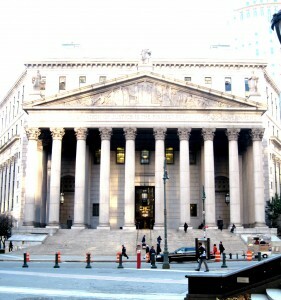 Recently I got a summons and trotted down to 111 Center Street. On day one, I ran into a friend which was delightful. Ultimately, we were sent to a courtroom presided over by Judge S., a friendly, charming man. If I had to serve, I’d have been happy to be in his courtroom, especially as the case, a criminal one, sounded interesting. However, I didn’t survive the voire dire so, after two full days, I was handed my get-out-of-jail free card and left. One of the nicer perks of Manhattan jury duty is lunch since the courts are very close to Chinatown and other ethnic spots. On day one, my friend and I ate at Pho Pasteur, a Vietnamese place that’s been around for ages. Pho is said to have originated in Hanoi in the early 20th century and was made with noodles, to please the Vietnamese, and beef to please the French. Basically, it’s noodle soup with a beef broth, a particular kind of white rice noodle and served with Thai basil, sprouts, chopped scallions and other ingredients. It can come with thin slices of brisket, steak, meatballs and something called “tendon” that I’ve never wanted to try—sounds too chewy. 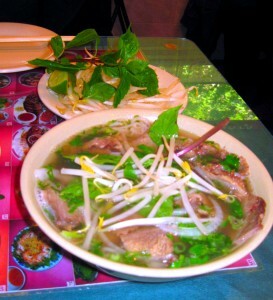 There’s also chicken Pho with its own many variations. Various sauces are offered on the side so the eater can season the pho to taste. I had “standard” Pho with brisket in thin slices. There’s no way to eat the noodles other than to wield chopsticks and Chinese soup spoon and slurp. We also ordered a pork dish of very thin cutlets topped with chopped peanuts on more rice noodles that were thinner than those in the pho and my friend had Com Xao Bo, a beef dish with red and green peppers that she loved. 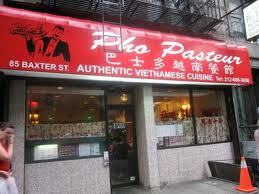 Pho Pasteur at 85 Baxter Street is a great value—our entire bill was under $20. It’s only crowded from twelve thirty to one thirty because of jury lunch hour but even then the wait is brief. Heat one teaspoon of oil in a large skillet over medium-high heat. Add ginger and chicken and sauté until cooked thoroughly, 7-10 minutes. Set aside. In large bowl, whisk together the reserved two teaspoons of oil, rice vinegar, teriyaki sauce, and honey, until mixed thoroughly. Add chicken mixture, carrot, scallions and almonds and toss together. 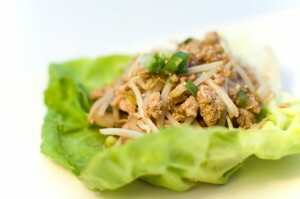 To serve, spoon a large tablespoon of the chicken mixture onto the center of each lettuce leaf. Roll leaf around filling and serve. I wrap it like a burrito, bottom up and then rolling the sides in. It’s messy so a utensil is useful to eat what you drop. 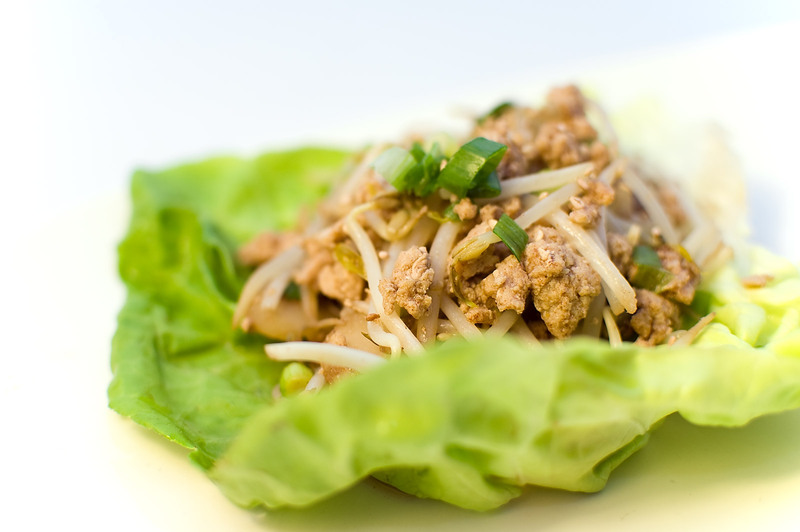 This entry was posted in Uncategorized and tagged chicken, drug bust, jury, lettuce, pho. Bookmark the permalink. Another good story. Makes me hungry for some good Chinese food, not jury duty. I guess after an hour, you’re hungry again, so that’s why the recipe is there twice? Didn’t realize it was there twice. Guess the reason is I messed up when transferring copy from word to blog! Thanks much. Please sign up to get this blog regularly. Thanks very much. Please sign up for more.